What a mess! (and a tutorial :) – It Works For Bobbi! It’s a tad late, but there was NO WAY I was going to let this craft pass me by. 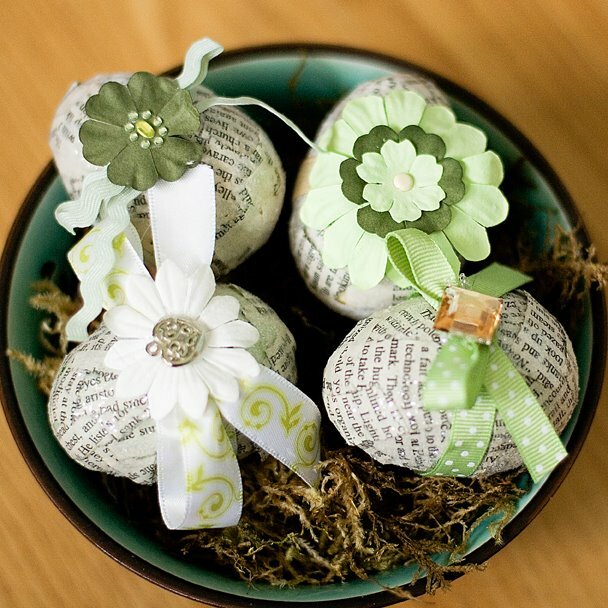 I came across the idea for these gorgeous Easter Eggs HERE. Hers are much more glamorous, but maybe in the future I’ll make a few more and actually put more effort in. LOL! It was definitely a craft meant for older kids and adults, though my girls (even my 3 year old) gave it a good go. I went with “green” for mine, and I used the coarse glitter from Martha Stewart’s collection. It was SO MUCH FUN! Hint: it’s easiest to use small peices of paper in squares if you want it to lay smoother. I am so happy about these, and the girls love their as well – they are eggs that won’t go bad and they can keep them forever (or until I find them lying around the house one too many times and they find themselves in the garbage. ). They tried ONE paper egg, then resorted to covering theirs with foam stickers. MUCH easier and less messy. Trust me – be prepared to get sticky! I’ve still got glitter all over my table. But so worth it, am I right? This is the project I made using the matted frame I bought at Michaels. Anyone who’s been to my house has seen my framed “Living Christ” and “Relief Society Declaration” matted with small pictures of the Savior (you know those small pass-along size cards you can buy?) 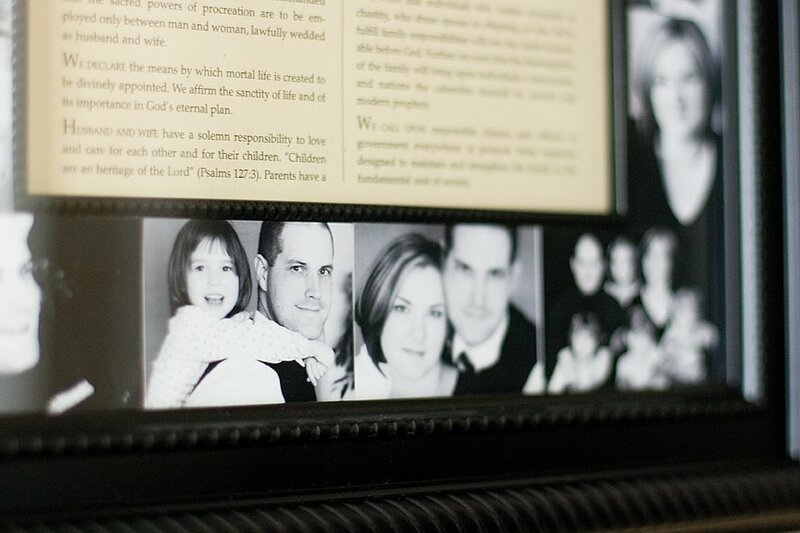 and I’ve been wanting to do our “The Family: A Proclamation to the World” with small photos of our family. I measured the width and height of the matt and printed off black and white photos enough to fill the matt. It took minutes and I love how it turned out. Now I’ve got all three documents proudly displayed! YES! I only did one layout these past few days, and it is going to go beside THIS layout in my album. I threw this one together quickly – which is usually what happens when I choose a linear, clean layout on the page. 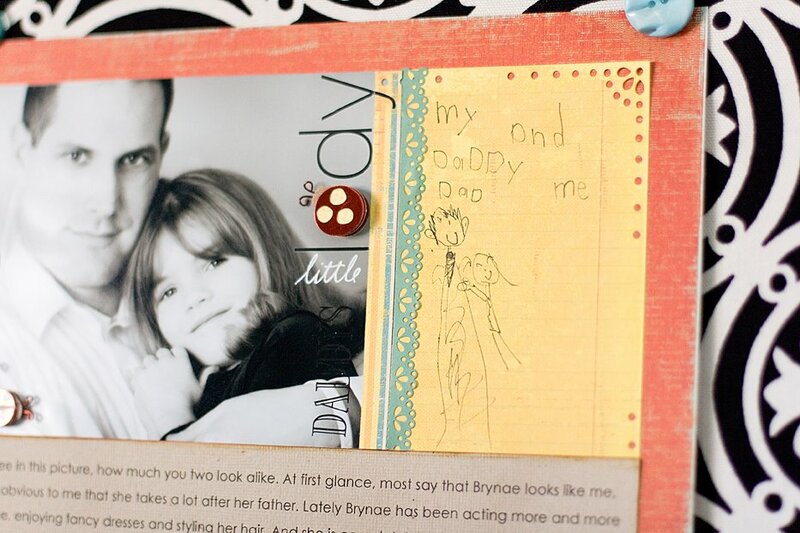 I had a space beside the photo, so I had the brainstorm to have Bryn draw a picture of her and her daddy. So cute. The only thing I’m really not lovin’ is the title. I can hardly see the word “Daddy’s” – too dark. I may re-do it with white. Still haven’t decided. Ooooh, I’m so excited, though, because I JUST received my Kit of the month today! YIPPEE! SO exited to use the kit to quickly throw together pages this year. Can I also say how much I’m loving the co-ordinating products (K&Co) from Michaels? We only have one tiny scrapbook store here, and their product is very out dated. I rely on Michaels for a lot of supplies. 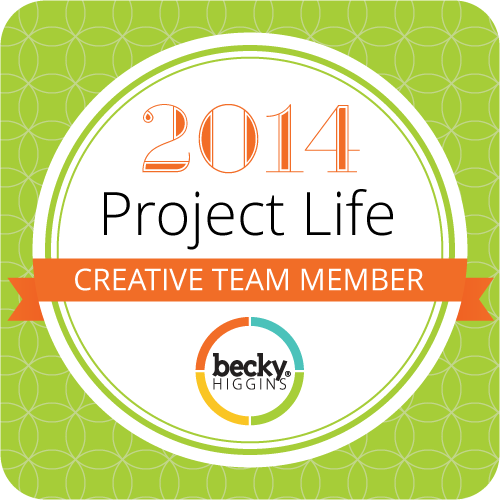 I love how they have a tonne of product that all co-ordinates – makes quick work of my pages. I received this RAK from my pal Michelle in my last hometown. WHAT A FUN SURPRISE!!! YAY! Totally made my day. She is UBER talented, and I was so happy to have this fun surprise waiting for me in the mailbox. THANKS MICHELLE!!! Okay, Okay, Okay….. tutorial time! I want to show you what some of those funky tools do in your tools palette, and this one we’ll be focusing on the patch tool. THIS IS SO COOL! You’ll love this tool when you know how it works. Unfortunately, this tool isn’t found in Elements – at least not Elements 5. Maybe Elements 6 has it – not sure. Sorry guys – I’ll do an Elements tutorial next week fo sho! 2. 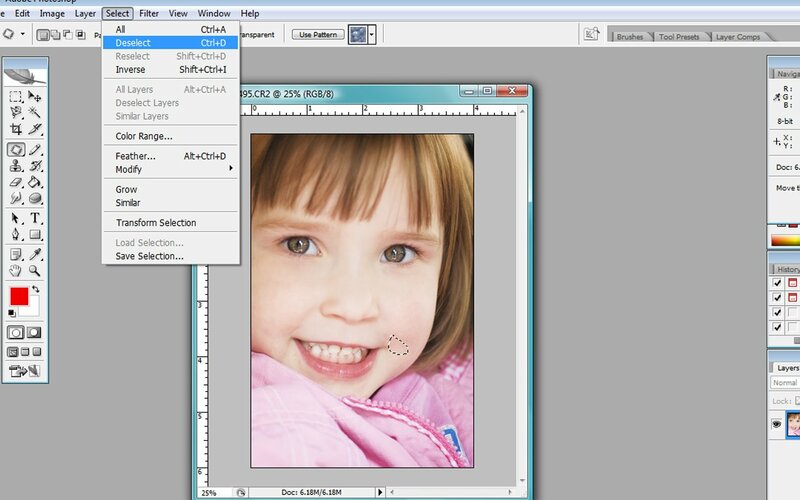 Select the patch tool, which might be hidden behind the healing brush tool. Just Right click on it and select the tool that looks like a cloth patch. 3. 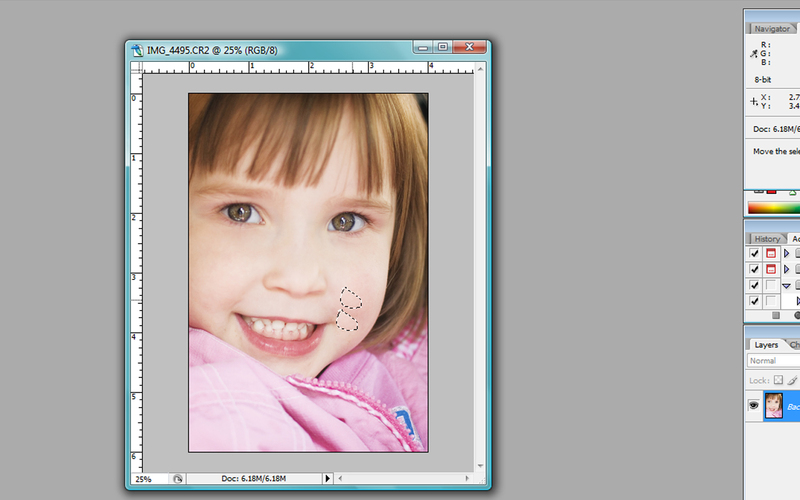 Now, move your mouse over the smudge or blemish and draw a selection around it by clicking and dragging the mouse around it. It doesn’t have to be a very precise line around it, just draw around it. 4. 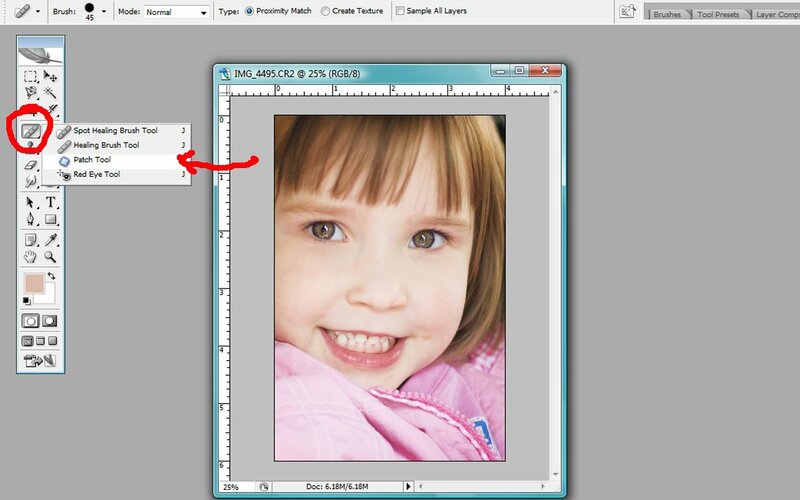 Click on the middle part of the selection you made and (while holding down the mouse button) drag the selection to a spot near the blemish that is clean – that looks like what you want the spot with the blemish to look like. 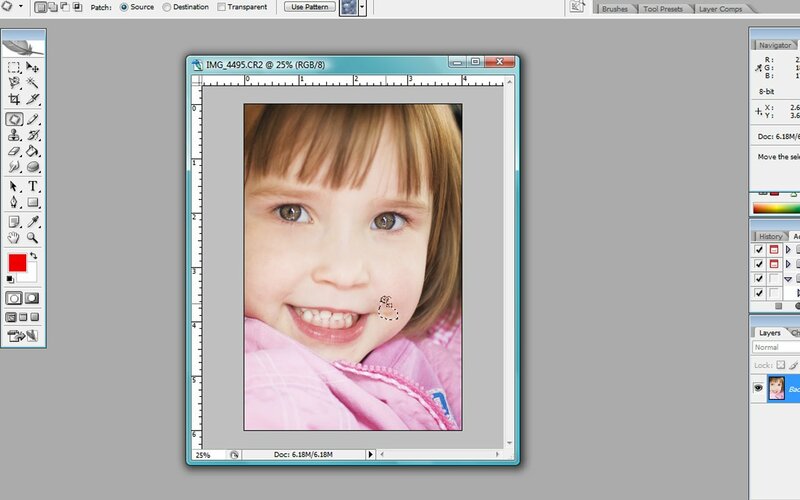 This works kind of like the clone tool only better!. After you drag it, just let go of the button and VOILA! your blemish is gone. 5. To get rid of the marching ants, just deselect by clicking on Select>Deselect. DONE AND DONE! I use this tool all the time. When you get comfortable with it, it’s so fast. Try it out and experiment! Next Ratatouille, Gratitude, and Surprises! I would like to make the following comments:1. egg craft- Oooooo! Pretty!2. Matted frame – NICE! Great idea!3. 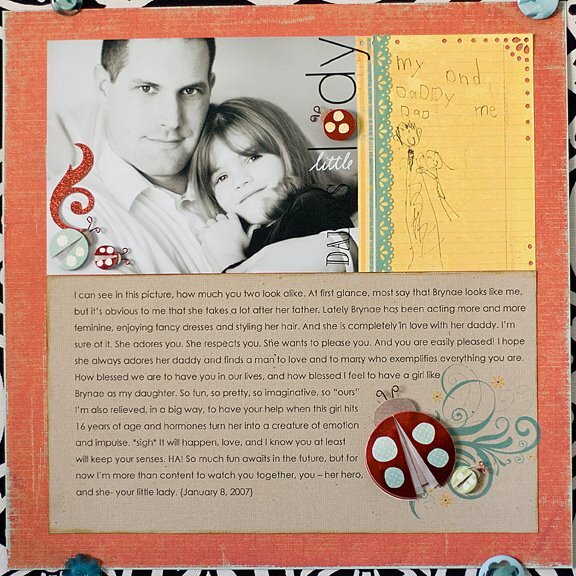 Layout – Awwwwww……I love to see a little girl loving her daddy so much. It speaks volumes about what kind of man her daddy is.4. RAK – Gorgeous! Congratulations!5. Tutorial – So good! As always. : DGreat post Bobbi! Awesome stuff!I love the family proclamation frame- I will proabably have to copy cat that!Such a sweet layout- I love how you have your daughter’s drawing and writing incorporated! Those eggs are super. I wouldn’t have the patience!! 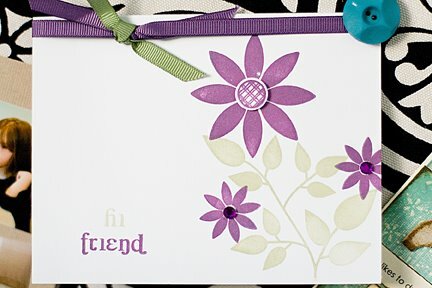 !Love the frame – very very special indeed.& the layout is adorable. Love how you got B to draw a pic.Thanks for sharing! Love your family proclimation! I saw them do that at a super saturday one time and I loved the idea and swore I would do it some day too, but never did. Maybe you just remotivated me to do it. We’ll have to see. Can’t wait to try this tutorial! Thank you for all that you put into doing these tutorials for us! I appriciate it so much! You are fan-freakin’-tastic!!! Our birth mom made us a proclamation similar to yours and it is so my favorite! Such a beautiful reminder. 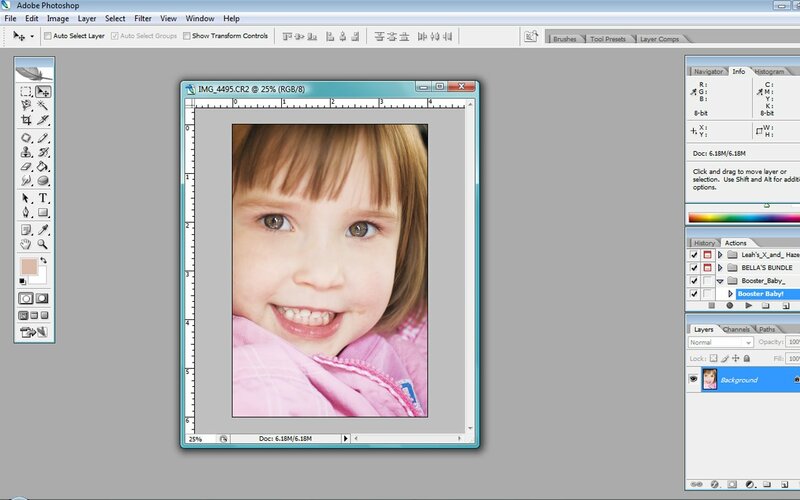 And of course another great tutorial!p.s. your eggs turned out beautiful!!! I love you eggs! I had good intentions of doing some easter projects this year and just totally didn’t get around to it…maybe next year, right?Thanks for sharing!! 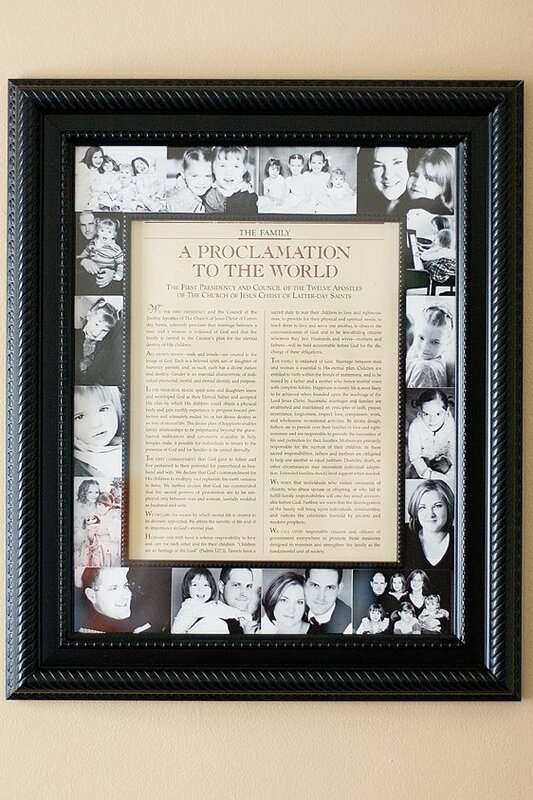 Bobbi, thanks for stopping by my blog and saying hi!I love the frame you made for the Family Proclamation, such a cute idea. Great layouts too!